If my son decides to play football, I want him to be the kicker…at least that was what I thought until I watched the kicker from Baylor take a knock-you-off-your-feet hit that left him slumped over like a puppy dog. Football is rough. And, it is exciting. The Michigan State vs. Baylor Cotton Bowl game proves my point. If you didn’t view it, let me re-cap briefly: Connor Cook, M.S.U. quarterback, started off throwing grounder after grounder to his receivers. Bryce Petty, Baylor quarterback, launched epic pass after pass to his receivers. The score was 24-14 at the half. It looked dismal for Michigan State–at best. Baylor was quite likely ready to run up the score for not being picked to play in the final four championship games; they were ready to prove themselves to the world, and especially prove themselves to the special committee for not picking them to play in the championship games. What happened next is what I call nothing short of amazing leadership. In my mind, three things occurred that helped the Michigan State Spartans come back and win the game over Baylor 42-41. We can learn from these leaders. 1. Mark Dantonio is solid. This M.S.U. head coach is like a rock. Media personnel often tease him for not smiling and not showing any expression. I questioned this stone-faced approach myself. His players mess up, yet he shows no disappointment; no f-words launch from his mouth. I secretly wonder how he does it. I know as a dentist, and quite an expression-filled one I might add, I want to occasionally let a few words fly out of my mouth. Instead, I have to admit, my words stay inside, but my expressions sometimes give me away. I have had to work hard at not letting my non-verbals ruin the moment. Dantonio has this down. I cannot think of any quarterback that does not feel bad when he spirals a pass into the feet of his teammate. I cannot think of any player that feels no remorse when he or she trips and falls before a play is executed. It happens. How the coach–the leader–reacts is so crucial to how the rest of the game will turn out. Dentists are the coaches, like it or not. How we react to adversity influences the outcome. When we hang our heads with disapproval, our “players” take double blows to their egos; the first one is delivered to themselves, and the second one is delivered by our non-verbal communication. It took me a number of years before I became good at praising the positive and letting go of my team’s mistakes. Today, I have a pretty good game face, like Mark Dantonio. I am more believable. I may be frustrated during a procedure because the wrong instrument was unavailable or dropped for the fifth time, but the error needs not be compounded in front of a patient. Further training is likely required, or even a change in the line-up may be warranted. This can and should be addressed in warm-ups and during practice–not on game day, not in front of our fans (our patients). I do direct and re-direct in front of patients because there are only so many opportunities to teach, but my comments remain as positive as possible. I am not claiming perfection; I am an affective teacher on most days, but not all days. I can appreciate the great work and restraint Mark Dantonio displays to his team. I know, firsthand, this type of leadership takes practice. 2. Defensive coordinator, Pat Narduzzi, did something different the second half: He came down from the upstairs coaching box and led from an on-the-field position. He made something happen. He told his players he believed in them with his actions. Despite getting hammered, he stood by them–literally–and believed in them. He worked to fire them up…and most importantly, his actions said, “I believe in you. I am right here with you–even through adversity. I am not done, and neither are you.” As dentists, our team needs to know we are with them, even when things are not going well. 3. Connor Cook, despite throwing grass pass after grass pass, had teammates that believed in him. Cook looked disheveled and disheartened in the first half–clearly disappointed in his performance. But, his teammates did not give up on him. They knew his talent. They had seen his miracle passes in previous games. They held him up when he lost a bit of confidence in himself. And, Connor Cook did not give up completely either, despite a lackluster beginning. He could have folded up and been disgruntled at himself for the rest of the game. Instead, he chose to let go and believe in himself. Being able to believe in himself and recognize he had the team’s support made all the difference in the game. The team believed in him, and, therefore, he did not have to work as hard to bring himself back up; the team lifted him up. In any group setting, team dynamics win or lose games. In our offices, the team must be able to believe in the dentist from a clinical standpoint and from a leadership standpoint. Additionally, the dentist must be able to believe in his or her team. Once this is established, both leader and follower can hold one another other up as needed, especially during adverse times. I am certain the Michigan State Spartans would have lost the game had these three things not occurred in their Cotton Bowl come back performance. 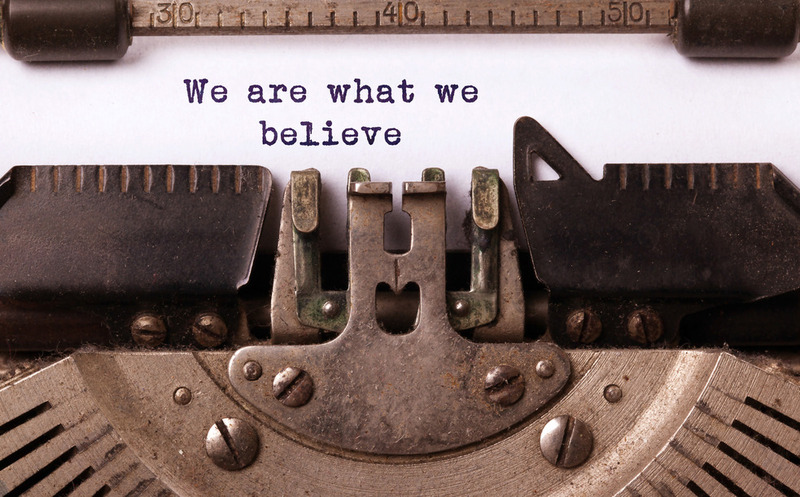 As a former college athlete and now leader in dentistry, I can attest to the power of belief. We, as dentists, must be believable and we must believe in others. To be believable–we have to walk the talk. To do this, first of all, we must have the skills to be believable. Connor Cook and Bryce Petty spend (and have spent) endless hours throwing passes and running plays. We, too, have spent endless hours perfecting our clinical dentistry, and we must keep up with these changes. But, what if that is all Cook and Petty did to lead their teams? What if they just learned to run certain plays and throw the ball? What if their coaches failed to teach them how to be good teammates and communicate with their linemen or running backs? What if they only taught them ten plays and never helped them learn to move out of the pocket or take a hit? Do you think they would stay challenged? Do you think their teams would function as well without coaching? No. Players get off track. They lose sight of why they are doing the work day in and day out. Coaches help teams remember–remember how good they are–remember the fundamentals of success–remember how to treat others. Dentists are the coaches of our teams (and need coaches). We are the ones learning the new plays (our new procedures), and we are the ones motivating our teams through coaching and teaching. We have double duty. We are the players, and we are the coaches. Dentistry is rough. And, I feel like a slumped over puppy some days, too. I get knocked off my feet by rude patients, tough root tips, and under-performing co-workers. How I react makes all of the difference to my team. I am the leader. They watch me. They watch us. Consistent great leadership grows by dealing with adversity. Anyone can lead a team during the good times. Learning what to do during the bad times not only helps our players, it also helps us. This is energy draining, however, so we need our coaches, too. During my early leadership days, I would become easily frustrated and drained with my dental assistants. If they made too many errors, I would stop talking and lose faith in them instantly. I stopped believing in them. I learned that my disbelief was a bit too premature. My coaching is what needed to change, not necessarily their learning speed. I wish someone would had taught me to be a better coach and leader sooner. Instead I had to strike out on my own. Luckily, I chose to work on this on my own–despite a profession that quickly emphasizes products and procedures. I recognized my leadership weaknesses, and I wanted to get better. Many professionals ignore the leadership side of dentistry. They simply keep learning new plays and procedures and ignore the leadership role desired by their teams. In my opinion, what we do is too important to ignore leadership excellence. The Michigan State Spartans demonstrated how exceptional leadership brings winning outcomes. I chose to add dental consulting to my career because I enjoy teaching dentists to be better leaders and obtain more winning outcomes. It is a portion of dentistry often brushed aside in curriculums, but absolutely necessary in the real world. Without feedback and an outside perspective, we end up running the same plays, losing good team members or fans, and losing more games than necessary. We sweat more than necessary and lose more sleep than necessary. Learning to be a good coach often occurs after being with a good coach. I know I benefitted from many great mentors in my life, and I learned from those coaches. If you are looking for leadership strategies for 2015, I hope you will consider hiring a coach. I hope you will consider hiring me as your coach and dental consultant. I help dentists be believable leaders. I take my hat off to the Michigan State Spartans football team for being believable–for believing in themselves and in each other. Great leadership, gentlemen! Contact Dr. Knowles at IntentionalDental@gmail.com. Her website is IntentionaDental.com. Dr. Knowles offers dental consulting as well as speaking engagements. Contact her to speak at your next dental meeting.